Grady Tripp is a pot-smoking middle aged novelist who has stalled on a 2611-page opus titled Wonder Boys. His student James Leer is a troubled young writer obsessed by Hollywood suicides and at work on his own first novel. Grady’s bizarre editor Terry Crabtree and another student, Hannah Green, come together in his wildly comic, moving, and finally profound search for an ending to his book and a purpose to his life. 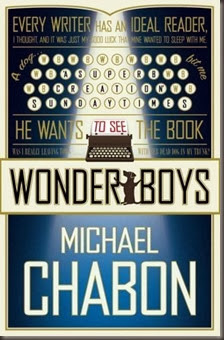 This is the second of Michael Chabon’s novels that I’ve read – and in a very short time, too. I still have no idea how to review The Amazing Adventures of Kavalier & Clay, which may rank as one of my all-time favourite novels. (Needless to say, it’s not difficult for me to see why it won the Pulitzer Prize.) 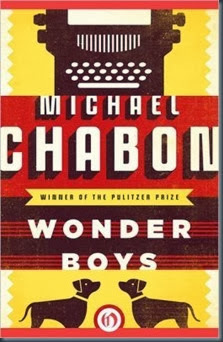 Wonder Boys, the novel Chabon wrote before Kavalier & Clay, is a rather different novel. It’s nowhere near as long, for one thing – and yet, strangely, it feels far more rambling and unfocused. I enjoyed it a great deal, and zipped through it in just a couple of days. Chabon has a wonderful way with words that can make even the mundane a pleasure to read about. The main character is almost archetypical, struggling author with writer’s block. Wonder Boys is basically the story of his long-time spiral of self-destruction coming to a head. Over the course of a single weekend, his wife leaves him, his affair takes a shocking turn, lots of people realise that he’s a nightmare and kind of feckless. He also has to attempt to keep his rather predatory editor away from one of his potentially-suicidal students. Along the way, there is a dead dog, one of Marilyn Monroe’s jackets, a shoot-out in an alley, and also a massive dead snake. And some Korean Jews. And a heavy amount of drug consumption. I haven’t read much literary fiction (or whatever genre this is meant to be in), but there are some tropes that are popping up. They seem to be predictable in their unpredictability. Strange things happen. People do really weird things (see, for example, the bacchanal in The Secret History). They react in slightly melodramatic ways. And yet… there is a way that Chabon writes these little weirdnesses that feels very natural. Realistic, and not actually forced or jarring. Without walking through the whole plot, it’s tricky to know what to write for this review. I am not aiming for a review in the style of the New Yorker, The New Republic, or Harper’s, so I’m not going to attempt to deconstruct this in any intellectual or academic manner. That’s not what the blog is for. What I will say, though, is that if you’re after a slightly strange, well-written novel about a writing professor at a small Ohio University going crazy, then this is for you. It’s witty, engaging, rather addictive, and very quirky.